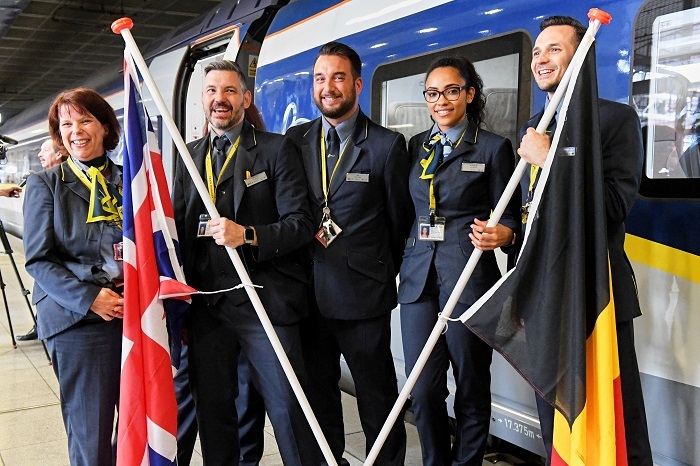 Eurostar has today previewed its new e320 train on the London-Brussels route in advance of its introduction into service on Sunday. The arrival of the new trains on the Brussels service is part of a £1 billion programme of investment in Eurostar’s fleet, stations and service which included the purchase of 17 new e320 trains and the refurbishment of its original trains. The e320, which has been operating successfully on the London-Paris route since November 2015, is proving very popular with customers who appreciate the enhanced features and technology of the new trains. Designed by the world-famous Italian design house, Pininfarina, renowned for its iconic car designs, the e320 boasts 20 per cent more capacity than the original Eurostar trains. With a bold design, chic interiors as well as Wi-Fi connectivity and 300 hours of on-board entertainment streamed to customers’ personal devices, the new trains provide an unprecedented level of style and comfort. Travellers arriving in Brussels can also connect to further destinations on a single ticket with the Any Belgian Station functionality. Nicolas Petrovic, chief executive, Eurostar, said: “The introduction of the e320 on the Brussels route marks an important milestone and step change in the travel experience for our customers. “With demand for high-speed rail over plane on the increase, we are now gearing up to expand our reach to the Amsterdam and Rotterdam. The introduction of the e320 on the London-Brussels service also follows an extensive renovation of the Eurostar terminal in Brussels Midi. This has created an expanded departure area and a more efficient check-in space which will be further enhanced by the introduction of facial recognition e-passport gate technology for the peak summer holiday period. Michel Jadot, director marketing and sales SNCB, said: “The result of our efforts to revamp the Channel Terminal into a bigger and brighter check-in area can be witnessed today. “The capacity has increased, matching the new trains on the Brussels-London route, which are able to transport more passengers. “Special attention was dedicated to improving the customer flow with the new, larger check-in structure of the terminal offering far more easy access. Eurostar is at an exciting stage in its development as it expands its reach further into Europe. With its new e320 trains, which are interoperable and can operate on the European high-speed network beyond the UK, France and Belgium, the company is in the final stages of preparation for the launch of its new direct service to Amsterdam and Rotterdam. With over three million leisure and business passengers travelling by air between London and Amsterdam, this is one of Europe’s most important routes. The introduction of a fast, comfortable point-to-point Eurostar service will greatly enhance the links between the UK and the Netherlands, revolutionising travel between these key financial and tourist hubs. Test services are expected to run toward the end of the year, with commercial departures beginning in early 2018. Marjon Kaper, managing director NS International, said: “The preparations for the direct connection between Amsterdam and London with Eurostar and NS are progressing well. “All partners are working hard on this. “Today is a very special day for NS and all the partners, because the start of services with the new train to Brussels literally brings the Amsterdam Route closer. Over the next eighteen months Eurostar will complete the introduction of 17 new e320 trains and the refurbishment of its original fleet.